DMI Office Furniture Rue de Lyon Collection Computer L Desk is quality crafted with maple solids, select hardwood detailing and American cherry veneers. 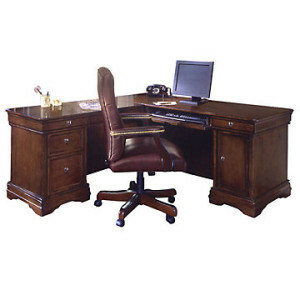 L desk consists of main desk: 66″W x 28″D x 30″H and return: 48″W x 24″D x 30″H. Computer conveniences include a tower computer cabinet (11″W x 23-3/4″D x 19-5/8″H) and two adjustable shelves, and a drop-front drawer that opens to a pull-out keyboard tray. Three utility drawers (two felt-lined with pencil trays and one with wood dividers) and a locking letter/legal-size file drawer that features full extension slides provide ample storage. Ships assembled, simply attach return.